Nineteen Eighty-Four is a classic dystopian novel by English author George Orwell. Published in 1949, it is set in the eponymous year and focuses on a repressive, totalitarian regime. The story follows the life of one seemingly insignificant man, Winston Smith, a civil servant assigned the task of falsifying records and political literature, thus effectively perpetuating propaganda, who grows disillusioned with his meagre existence and so begins a rebellion against the system. The novel has become famous for its portrayal of surveillance and society’s increasing encroachment on the rights of the individual. Since its publication the terms Big Brother and Orwellian have entered the popular vernacular. Orwell, who had “encapsulated the thesis at the heart of his novel” in 1944, wrote most of Nineteen Eighty-Four on the island of Jura, Scotland, during 1947-1948 while critically ill with tuberculosis. He sent the final typescript to his friends Secker and Warburg on 4 December 1948 and the book was published on 8 June 1949. Nineteen Eighty-Four has been translated into more than 50 languages. The novel’s title, its terms, its language (Newspeak), and its author’s surname are bywords for personal privacy lost to national state security. The adjective “Orwellian” denotes many things. It can refer to totalitarian action or organization, as well as governmental attempts to control or misuse information for the purposes of controlling, pacifying or even subjugating the population. “Orwellian” can also refer generally to twisted language which says the opposite of what it truly means, or specifically governmental propagandizing by the misnaming of things; hence the “Ministry of Peace” in the novel actually deals with war and the “Ministry of Love” actually tortures people. Since the novel’s publication “Orwellian” has in fact become somewhat of a catch-all for any kind of governmental overreach or dishonesty and therefore has multiple meanings and applications. The phrase Big Brother is Watching You specifically connotes pervasive, invasive surveillance. Although the novel has been banned or challenged in some countries, it is, along with Brave New World by Aldous Huxley, We by Yevgeny Zamyatin, Kallocain by Karin Boye and Fahrenheit 451 by Ray Bradbury, among the most famous literary representations of dystopia. In 2005, Time magazine listed it among the hundred best English-language novels published since 1923. In his 1946 essay, “Why I Write”, Orwell described himself as a Democratic Socialist. 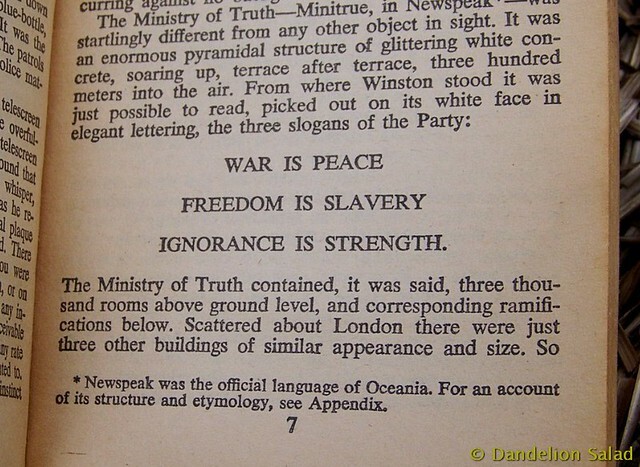 Nineteen Eighty-Four is set in Oceania, one of three intercontinental totalitarian super-states. The story occurs in London, the “chief city of Airstrip One”, itself a province of Oceania that “had once been called England or Britain”. Posters of the ruling Party’s leader, “Big Brother”, bearing the caption BIG BROTHER IS WATCHING YOU, dominate the city landscapes, while two-way television (the telescreen) dominates the private and public spaces of the populace. Oceania’s people are in three classes — the Inner Party, the Outer Party, and the Proles. The Party government controls the people via the Ministry of Truth (Minitrue), the workplace of protagonist Winston Smith, an Outer Party member. As in the Nazi and Stalinist regimes, propaganda is pervasive; Smith’s job is rewriting historical documents to match the contemporaneous party line, the orthodoxy of which changes daily. It therefore includes destroying evidence, amending newspaper articles, deleting the existence of people identified as “unpersons”. Written in 1948, 1984 was George Orwell’s chilling prophecy about the future. And while the year 1984 has come and gone, Orwell’s narrative is timelier than ever. 1984 presents a startling and haunting vision of the world, so powerful that it is completely convincing from start to finish. No one can deny the power of this novel, its hold on the imaginations of multiple generations of readers, or the resiliency of its admonitions. A legacy that seems only to grow with the passage of time. 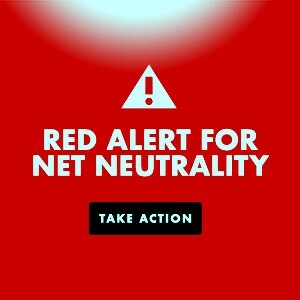 This entry was posted in All Posts News Politics and-or Videos, Big Brother - 1984, Dandelion Salad Videos, Domestic Spying, Fascism, Police State, Politics, Propaganda, War and tagged 1984, Book or Film Reviews or Excerpts, George Orwell, Must-See Video or Videos, Permanent War, Science-Fiction. Bookmark the permalink. I was so looking forward to seeing this film, but unfortunately the audio was too low to be able to listen without strain. A few years ago I increased the volume on my computer so don’t have that problem any longer. In fact, I must turn down the volume on many videos because it’s too loud. Do a search for “how to increase volume on your computer” and find out how to do it. Another thing you could try is doing a search on Youtube for a different upload of the film, it may be louder.